The drive to the National Park was long, or it just seemed long to me. K was very wiggly in the car. I was flexing my muscles and weighing my options. Either she will crash and sleep or I’ll have to chase her around once we get out. In any case a bit of stretching will help me. The drive once you are inside is very scenic. The landscape looks pristine and untouched. If you get up late for a lonavala drive on a Sunday morning then you know where to go. Its probably one of the rare places to be situated within the limits of a metropolis. 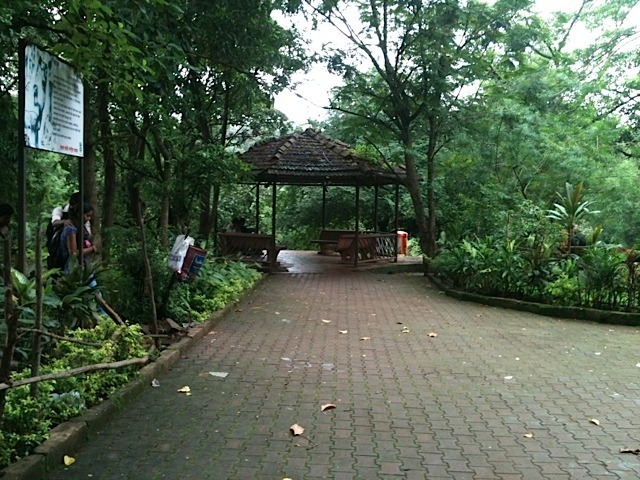 At the entry there are small parks. 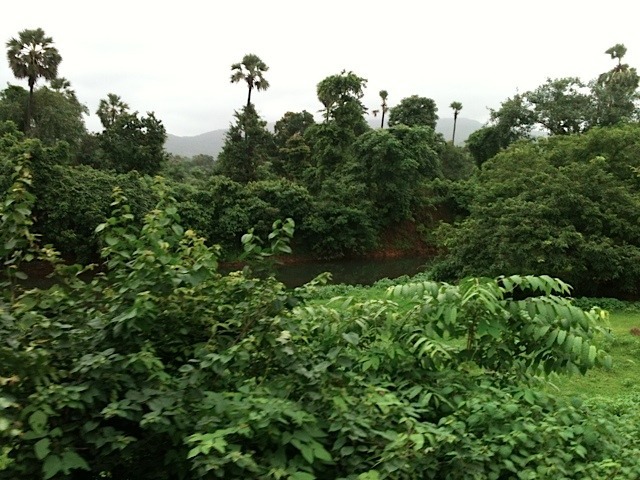 Its a treat to visit in the monsoon and also a treat for someone else?! Mosquitoes will bite you with vengeance. Long sleeves won’t help, so be creative. At the corners of the roads inside, there are vendors selling cucumber and star fruit with some masala. Cucumbers are savoury but use the masala at your risk. An array of butterflies and flowers are at its best display in the park. There are a few things that you can do here, tiger safari, bird watching, hiking, boating, picnicking, walking, cycling or just chilling! The famous Kanheri Caves (1st century B.C. to 9th century A.D.) are also located here. 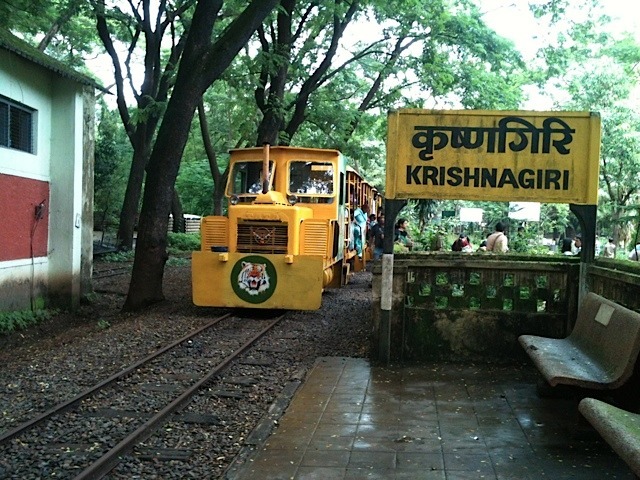 People with kids can try the toy train. 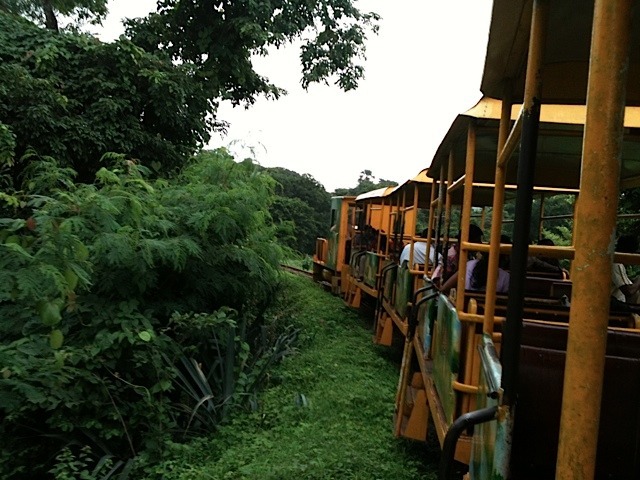 Its a nice ride among the woods and takes you to see few animals. They are somewhat caged but kept in their natural habitat. Though I think their food is delivered to them but this looks far better than the zoo. Few spotted deers, barsinghas, antelopes can be seen hopping almost free. There’s a bus ride you can take to see tigers (3 tiger cubs) and a lonely lion. They are enclosed in a fenced area which has a primitive gate with a big stone hanging at one end. 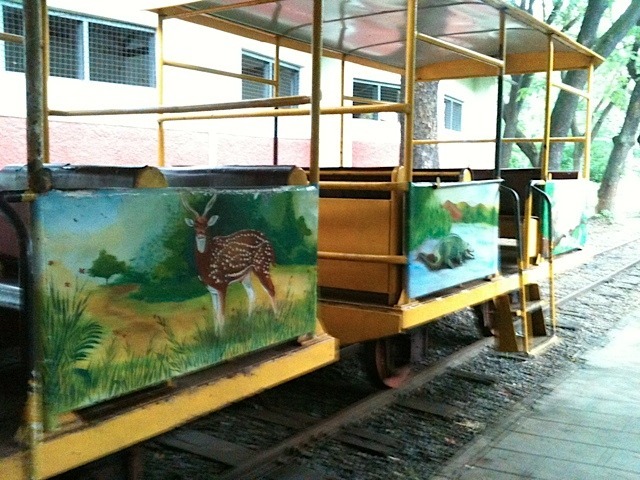 Not like an actual safari, but we should not ask for more being in Mumbai. There’s a small lake or stream where you can do boating. Huge trees lined up on either sides tempt you to sit and slow down. There are a couple of play equipments for toddlers. We did see few monkeys eve teasing visitors. So better be careful while carrying eatables. One thing that you can never escape being in this city is its propensity to gulp people. There’s encroachment everywhere in this park. It would seem unfair to house wild animals in so much real estate while the migrants barely get enough place to spread their feet. The wild deers graze besides the blue tarpaulin shanties. Sort of like having discovery channel in your backyard. Illegal construction is inching its way slowly inside the boundaries. 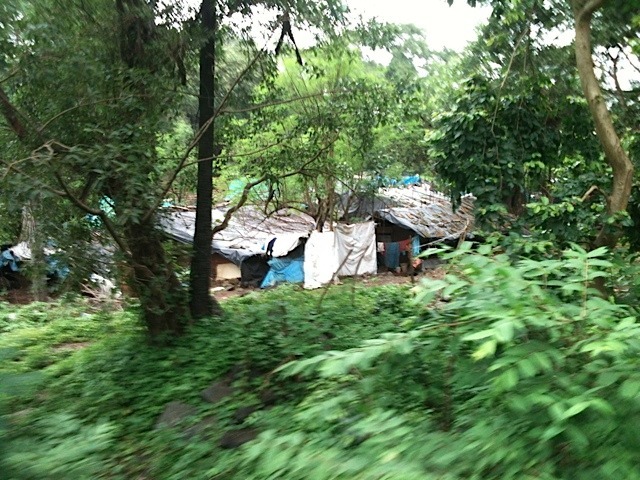 Its difficult to make an assessment of this place that is spread over a 100 sq.km. But all in all its a great place to visit with kids. If you are an enthusiast or an explorer you can join one of the nature or photography clubs who make frequent visits here.